SCOTTSDALE – Spring Training got off to a good start, because I ran into the chief executive of the San Francisco Giants Larry Baer at breakfast on Thursday morning at the Arizona Biltmore, where I’m staying for a few days. I first met Larry in the ’90s. A pointed meeting was in April 1996, when I worked at The Chronicle and got the “scoop” that the new Giants ballpark planned for China Basin was going to be called Pacific Bell Park (Pac Bell Park for short) in a $50 million sponsorship deal. The Giants were not pleased, because they had wanted to keep a lid on the deal a little longer. But to Larry’s credit Giants management visited the newspaper late in the day to discuss the deal, knowing that we were going to run with the story anyway. You can read the front-page article HERE. “You got it from Pac Bell didn’t you?” Larry said Thursday as we reminisced at Frank and Albert’s resaurant at the hotel and later in the lobby. “Ha!” I said. I was a business writer covering PacBell. Afterward, I went off to Scottsdale Park in an Uber and had great seats: two rows behind home plate on the aisle to watch the Giants play the Angels. 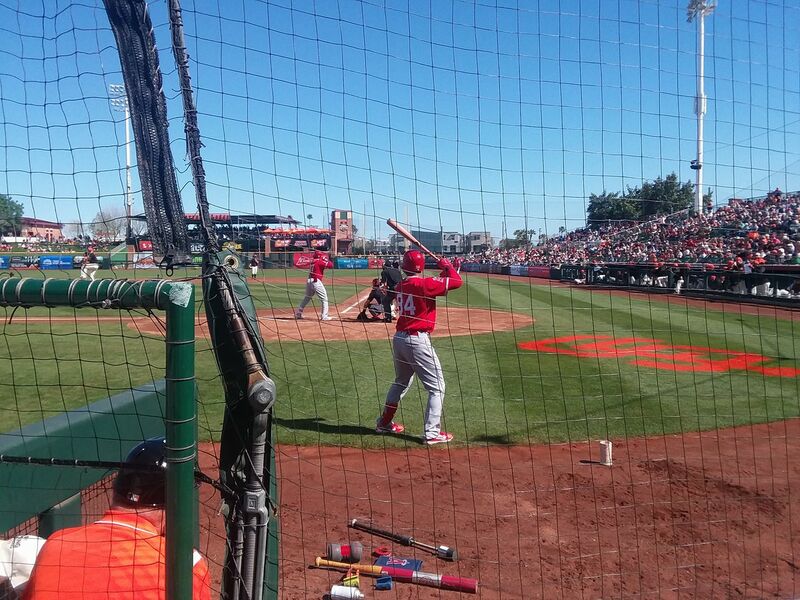 Spring Training is an intimate affair: You are right on top of the action. 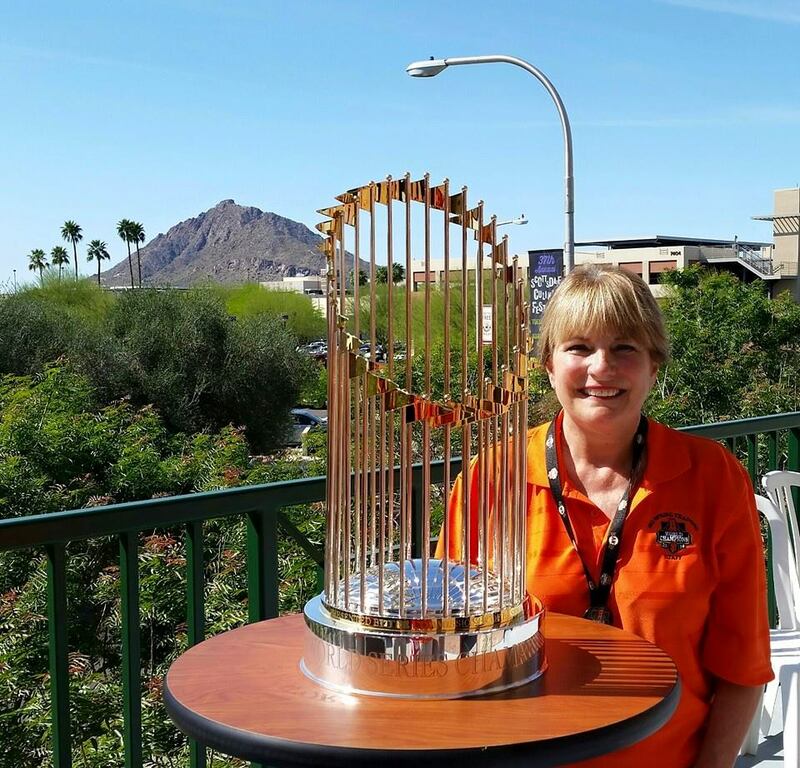 It also is like “going home.” A Nevada County local, Karen Seiler Campbell, comes to Scottsdale each year to work for the Giants at Spring Training . You can find her at Gate F.
Besides the meet-up with Baer, which was impromptu, I can visit with my former colleagues at The Chronicle, who are out in full force this season. The Angels routed the Giants 11-4 on Thursday at Scottsdale Stadium. Argh! The Giants started a more representative lineup, including Joe Panik, Brandon Belt, Andrew McCutchen and Evan Longoria. Brandon Crawford was supposed to make his Spring Training debut at shortstop, but he sat out with a sprained index finger. Buster Posey’s left ankle has been bothering him, and Hunter Pence is out with the flu. On the bright side, Panik was 1-3 as the leadoff hitter, and Chris Stanton, a front-runner for the starter rotation, pitched three scoreless innings. The Giants made two big name signings in McCutchen and Longoria this offseason — an active offseason after losing 97 games in 2017. I’ll expect to head back for Saturday’s game, when the Giants play the Rangers. The Rangers are expected to sign former Giant Tim Lincecum to a one-year deal worth over $1 million. 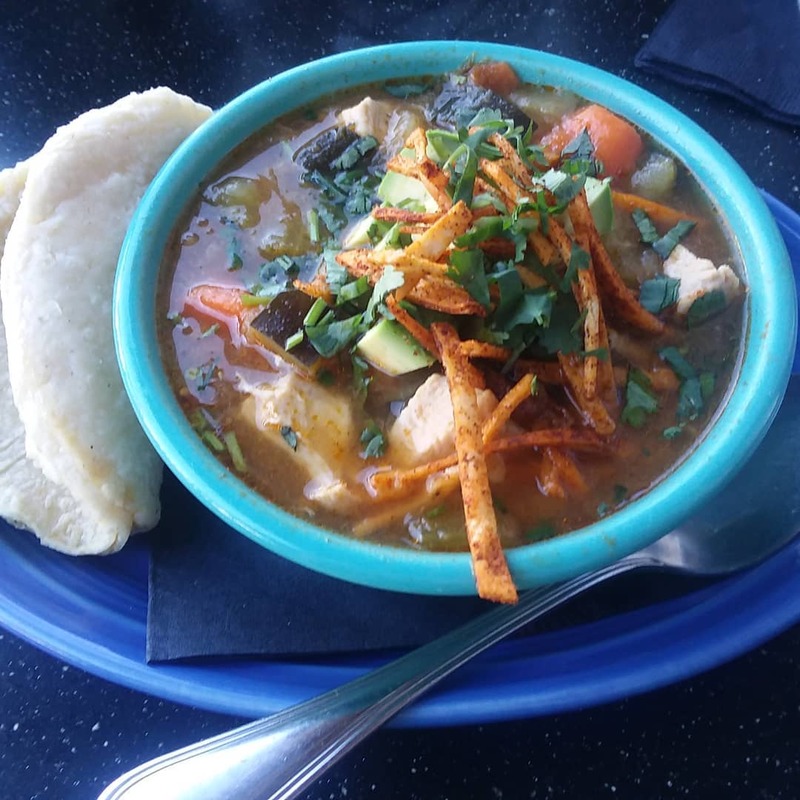 While in town, I like to grab lunch or dinner at Barrio Queen one of my favorite authentic Mexican restaurants. It was co-founded by James Beard Award-nominated chef Silvana Salicido Esparza. This time I enjoyed a cup of tortilla soup and the Enchilades Suizas. Around $10! What’s more Karen Campbell of Nevada City is one of the ticket sellers; she’ll get you good seats (see mention in article).